Zynga became a public company with $3.75 billion dollar market cap in part by taking existing physical games and introducing them to your browser and social graph. Poker and Scrabble are just two that immediately come to mind. But, lately we’ve seen Zynga flipping its model, turning to the offline world in an attempt to find new life beyond browsers and smartphones. As Eric reported in February, the company has been forging deals with toy companies and retailers, including, most notably, a big licensing deal with gaming giant, Hasbro. Through the new partnership, Hasbro and Zynga have been developing a series of titles that look to narrow the gap between digital and offline gaming, and today (via tip) we have our first glimpse of how the first of these will look. 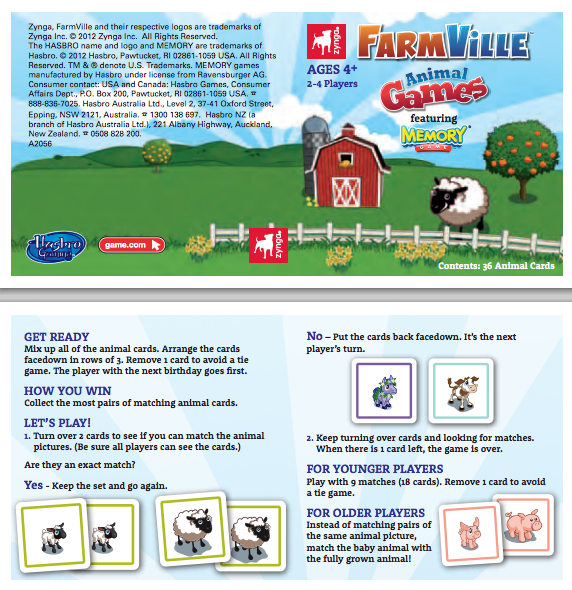 It’s called Farmville Memory, and it’s a card game for ages four and up. For both companies, the partnership is an opportunity to plug up leaky areas. For Hasbro, its digital partnerships represent a shot at revitalizing, at soaking up a little of that digital/social mojo, while for Zynga, Hasbro represents a serious shot at realizing its merchandizing dreams with a big national toy distributor. It remains to be seen just how much demand there is for Zynga offline, whether or not these offline plays can become a significant source of revenue. Though it certainly seems to be a well-worn page in the gaming playbook. Just ask Rovio, which seems to be perfecting the art, with 30 percent of its revenue in 2011 coming from merchandising and licensing. Those plush Angry Bird toys represent big dollars. If Hasbro’s games do find traction, it’s a bonus for Zynga, which already has its hands full with its cross-platform gaming network and API play. At any point, it can exercise that merchandizing channel, capitalize on licensing deals and its brand, but for it to stay a part of the conversation, it has to keep innovating and creating interesting new titles. Otherwise, it risks becoming “just another” gaming company. After all, just stamping its logo on a deck of cards isn’t going to be what keeps Zynga out front. While this is just a quick look into what’s in store, Farmville Memory doesn’t exactly inspire faith that the partnership will result in mind-blowing new games that go far beyond plush toys and card-tricks. Though of course, with the combined power of their brands and networks, the games will no doubt find more than a few eyeballs. And, for a younger audience, Farmville Memory looks to have plenty of appeal. Those sure are some cute sheep.